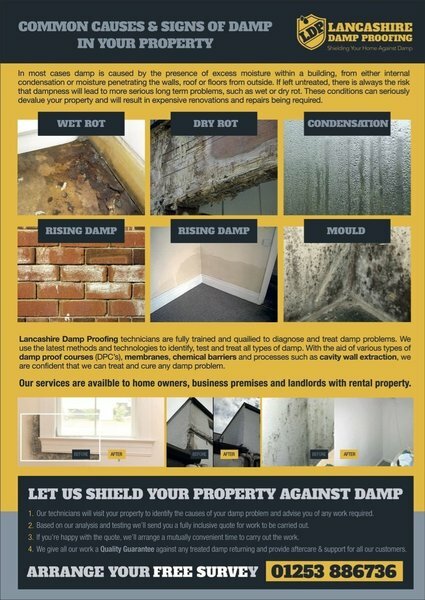 Whether you require damp proofing, or cavity wall extraction services, wet or dry rot treatment or basement conversion tanking and waterproofing, Lancashire Damp Proofing can provide a complete solution including; surveys, structural, remedial and any finishing services you may need to leave your property in good order and completely protected against damp. 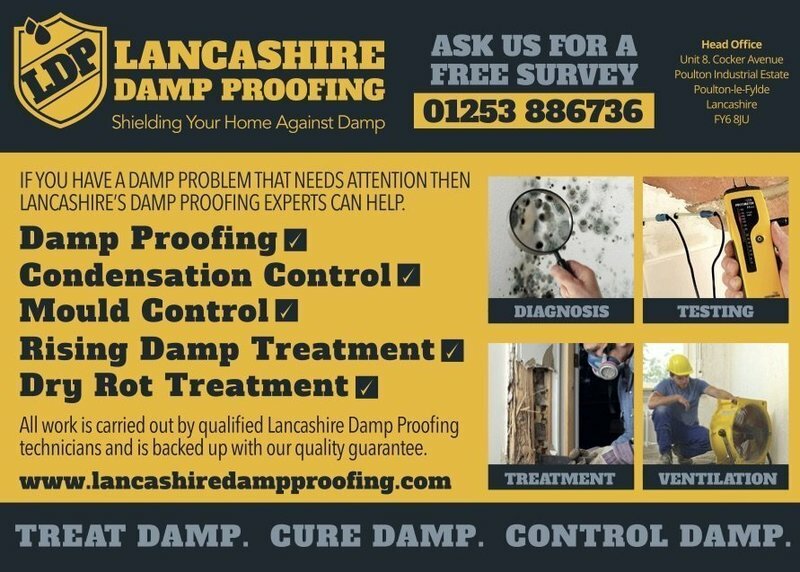 Lancashire Damp Proofing technicians are fully trained and qualified to diagnose and treat damp problems. 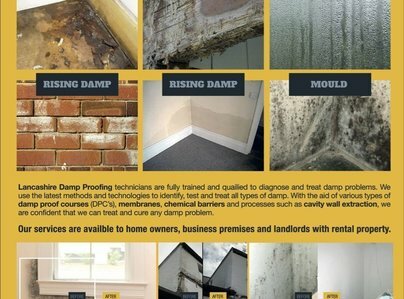 We use the latest methods and technologies to identify, test and treat all types of damp proof courses (DPC's), membranes, chemical barriers and processes such as cavity wall extraction, we are confident that we can control treat and cure any damp problem. Our services are available to homeowners, commercial property owners, property agents, landlords and buy-to-let investors. Contact us to arrange a FREE survey, for advice on any damp problem or for a competitive quote. 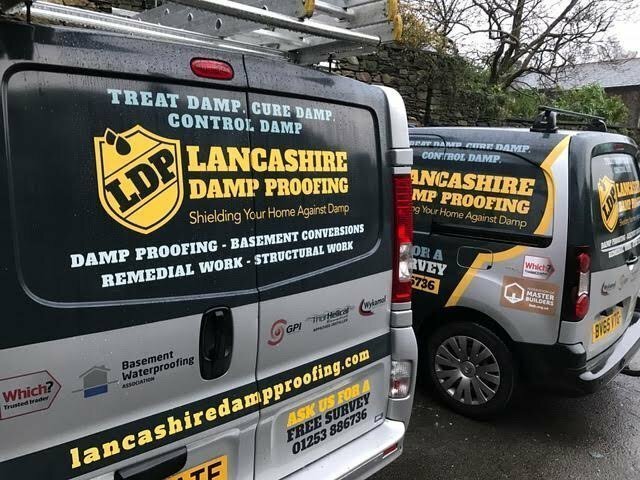 I had a number of issues with damp thru the house and contacted Lancashire Damp Proofing in August'18. Their quote was both reasonable and honest. I decided to have the work done in January'19, just within their original 6-month qualification. No additional survey was required and they worked round my schedule at very short notice. The works completed were timely, neat and very professional. The two Guys who completed the work were extremely polite and cleaned-up daily. I'd have no hesitation in recommending them to anyone. 5* service & works completed. Thank you. Extraction of cavity wall insulation. As advised by a damp and timber surveyor, we had to have badly installed cavity wall insulation removed which had been installed when the previous owners lived in our home, due to damp and mould on the interior walls. A surveyor from Lancashire Damp arrived on time to give us a quote which was comparable to other quotes we had received. 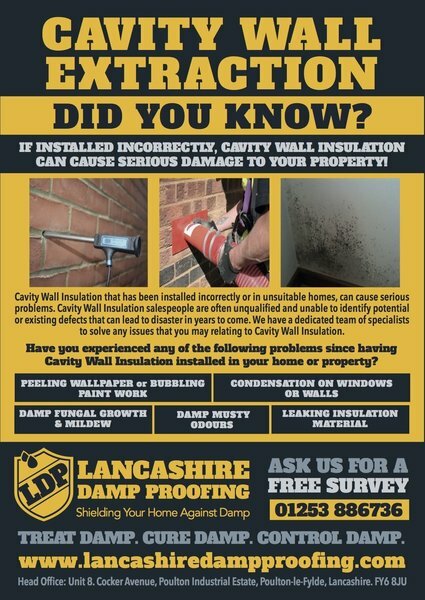 We chose Lancashire Damp because the surveyor did not try to push any other services on us as had other companies including more cavity wall insulation! On the day the work was carried out the workmen arrived on time if not slightly early and completed the work satisfactorily. They were also polite and friendly and explained what was happening as they worked. Within days of the work being carried out the walls are now damp free. Money well spent. 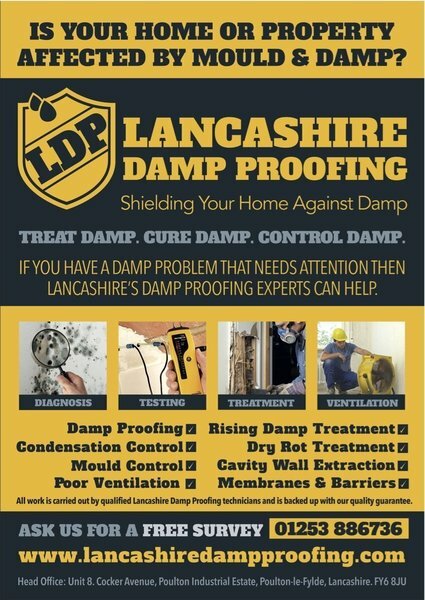 We would highly recommend Lancashire Damp. Requested a survey on mould, he came on time and he was very polite and professional. Although I do not need any work doing he gave me some great tips on how to rectify my problem. He could have easily said I need work doing. If I ever need work doing I would not hesitate to contact him. The property was badly affected by damp and I knew that in advance of Lee's inspection.Lee came round the following day to survey and produced a comprehensive remedial plan and diagram. The work involved the removal and replacement of existing floor, joists and skirting, removal of old plaster, installation of plastic membrane, installation of chemical damp proof course, boarding and skimming to most of the ground floor. The price was very fair for the vast amount of work that needed doing. The quality of the overall work was excellent and the plastering is the best I have seen. The guys are all friendly and very approachable. A survey was arranged very quickly and a report provided by email later the same day. Very helpful and all questions answered satisfactorily. Job scheduled within a week of accepting quote. We were told the Contractors would arrive at 9am on the day, we called at 10 to ask where they were as they hadn't arrived and hadn't called us. They arrived at 10;15 and seemed a bit annoyed that we'd called the office as they said "we've come all the way form Blackpool you know". We said we'd only called because we were told to expect them at 9am! Other than that they were polite and helpful, and cleared up as they went, leaving the room neat and tidy. The plastering work was amazing, such a smooth finish. Overall, we were very satisfied with the standard of work and the speed from initial enquiry to having the work completed and would recommend this company. They did damp proofing. Yes it was done to the agreed budget. They did a good job, they were friendly. Work carried out from start to finish was 1st class. Lancashire Damp Proofing provided a fantastic service from start to finish. Emailed enquiry received phone call some morning, appointment made, Lee arrived exactly on time, quickly established the cause of my damp walls & the work required to fix the problem. Happy with price so booked in, tradesmen arrived, again on time, carried out the work in a friendly, cheerful manner (in tropical conditions!) They were very knowledgeable & courteous, removed plaster from walls, installed damp proof course, replastered, replaced skirtings & covings where necessary, took away all rubbish & left it clean & tidy. I am so happy with the work & would highly recommend this company.